A native of Paw Paw, Mich., Babin is Western Michigan’s only first round NFL Draft selection to date, being taken with the 27th pick in the 2004 draft by the Houston Texans. 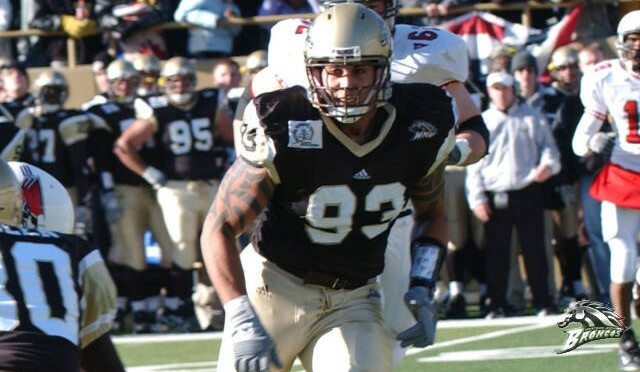 One of the most decorated players in WMU history, as a senior Babin earned first-team All-America honors from The NFL Draft Report and College Sports Report and added second-team honors from Sports Illustrated, The Sporting News and College Football News. He was additionally a Fourth Team Sporting News All-American in 2002. Babin was named the Mid-American Conference Defensive Player of the Year during his junior and senior seasons and was a three-time All-MAC selection - first team 2002 & 2003, second team 2001. He continues to hold multiple program records including career sacks (38), career tackles for loss (75) and single season tackles for loss (33). Over his NFL career, Babin has twice earned a spot in the Pro Bowl (2010 & ’11) and in 2011 amassed a career high 18 sacks, earning Second Team All-Pro honors. During his career in the NFL, Babin has suited up for the Houston Texans, Seattle Seahawks, Kansas City Chiefs, Philadelphia Eagles, Tennessee Titans, Jacksonville Jaguars and is currently with the New York Jets. Jason and his wife Sara have three sons, Maddux (9), Talan (7) and Bronson (1). Q: What is a particular memory that sticks out during your career at WMU? A: Looking back the thing that means the most to me were the bonds formed with teammates. That is something I will always carry with me. As far as a game, beating Central Michigan at home my senior year. I got up on the band director’s podium and we all sang along with the band. It was big victory for the team and the emotions that day were raw. Q: Why did you choose Western Michigan? A: I really related to Coach Darnell (former head coach Gary Darnell) and Coach Knowles (defensive coach), they were the kind of guys that were truthful and honest, the kind of guys you wanted to be around and buy into. It just felt like a great fit. Q: Who else made your time at Western Michigan special? A: The saying it takes a village, that’s true ... everyone in the athletic and academic department at the time, because I was a work in progress. Kathy Beauregard always had my best interest in mind, whether I knew it then or not, what she was saying and what she was doing was to help me be a better person. Q: What was your reaction when finding out you were among this year’s inductees? A: It caught me off guard, because it wasn’t on my radar. As it gets closer and I look at other inductees and their accomplishments, joining that group of incredible people is a little surreal. Q: What would you say to a young player with dreams of playing in the NFL? A: I have been blessed with unbelievable opportunities and I get to continue to write chapters so to speak, but the NFL is a business, not like college. I would say one be humble, because your situation is only temporary. Take the opportunity to learn from everyone around you, and don’t be late.